Wakefield Park Raceway was a hive of activity today, as riders got down to business at Round two of the Yamaha Motor Finance Australian Superbike Championship presented by Motul Pirelli. The Yamaha Motorcycle Insurance Superbikes and the Motul Supersport categories had the opportunity to put down their best times throughout qualifying sessions today, with the top six Superbike qualifiers also taking part in their first Pirelli Superbike Superpole for 2016. In the opening Motul Supersport qualifying session, it was Kawasaki mounted Sam Clarke who set the pace for the day with a 1:00.479 lap on fresh track conditions, while JNL Racing’s Luke Mitchell impressed with the second quickest time (1:00.683), ahead of Graffiti Alley Racing’s Troy Guenther who was just off the pace with a 1:01.036 lap. Repsol Triumph rider Mark Chiodo was a notable absentee from the front of the field, going down during the first qualifying session, leaving him with the 17th quickest time at the conclusion of the 25 minutes. When the Yamaha Motorcycle Insurance Superbike class hit the track for their first 30- minute qualifying session today, all eyes were once again on local Troy Herfoss (Crankt Protein Honda Racing), who’s times were unmatchable throughout Friday’s practice. And when bikes exited the pits, it took no time at all for Herfoss to find his flow, setting a quick lap time of 57:567 on lap five. However, it wasn’t long before a Yamaha machine chased down the local – Wayne Maxwell smashing out a new lap record on lap 11, with a 57:513, Herfoss was then relegated to second. With around ten minutes remaining, the first Superbike qualifying session was red flagged, due to a break down at turn ten, and when qualifying resumed no one was able to match the lightening fast speed of Maxwell, who held on to the top spot with his 57:513 lap. Second place qualifier was Herfoss on his Crankt Protein Honda machine (57:567) while Glenn Allerton wrapped up the 30-minute session in third (57.594). Ant West also made significant progress throughout the morning, concluding the first qualifying session in position four, with a 58.082 lap, while Yamaha mounted Cru Halliday rounded out the top five with a 58.266 lap. After an entertainment filled lunch break with pillion rides and stunt bike riders keeping the crowd cheering, the Motul Supersport category got their second qualifying session to a flying start. With the a Pirelli Superpole Award up for grabs, riders looked to find additional speed on what was beginning to be one hot track – and with Kawasaki’s Clarke having set a lightening fast pace this morning, he was the man to beat this afternoon. Despite Graffiti Alley Racing’s Guenther topping the time sheets during the final qualifying session for the day(1:00.607), Clarke’s morning pace could not be matched – the Kawasaki star snatching up the first Motul Supersport Pirelli Superpole for 2016, with a 1:00.479 lap at a sundrenched Wakefield Park. An elated Clarke shared his excitement in taking the first Motul Supersport Pirelli Superpole Award for 2016, and say’s he’s looking forward to being at the front of the grid when racing kicks off tomorrow. “I am feeling really good right about now that’s for sure – we had the pace at Phillip Island and unfortunately I went down, so coming here and rewarding the team with the bike on Pole is the best feeling ever,” he said. “Everyone out there is fast, and they’re all competition, you’ve got Troy and now a local guy who before this I hadn’t heard of, so we’re going to be battling out there tomorrow. When the Yamaha Motorcycle Insurance Superbikes headed out for their second qualifying session, fans were treated to thrills and spills, and by the time qualifying had reached the ten-minute mark, Brayden Elliott had come off in turn four, causing the session to be red flagged. Despite the crash, Elliott was able to get to his feet, and after a short break, qualifying resumed, with Crankt Protein Honda Racing Team’s Herfoss setting the pace for the field on lap 11 with a 57.648. DesmoSport Ducati’s Mike Jones was hot on the Honda’s tail, posting the second quickest time with a 58.191, while Allerton and Jon Daniels Racing’s Daniel Falzon were third and fourth in the second qualifying session respectively. When times from the two Superbike qualifying sessions were merged, the top six riders of Maxwell, Herfoss, Allerton, West, Jones, and Halliday progressed through to the Pirelli Superbike Superpole. The ten-minute head to head keeping fans on the edge of their seats. With riders squeezing as many quick laps as they could into the action packed 10 minutes, local Herfoss was determined to start on Pole at his home track. And his determination served him well, Herfoss setting the fastest time of 57:350 on the final lap, setting yet another new lap record on home soil. Despite Yamaha mounted Maxwell’s efforts, his quickest lap of 57.644 saw him conclude Pirelli Superpole in second, while teammate Allerton wrapped up the ten-minute shoot out in third after posting a lap time of 57.761. Yamaha Racing Team’s Halliday wrapped up his first Superpole outing for the year in fourth, while Ducati mounted Jones, and Honda’s West, wrapped up Superpole in fifth and sixth places respectively. Honda’s Herfoss was flooded with media after winning his first Pirelli Superpole for 2016, and shared that his Pirelli tyres played a crucial part in his outstanding performance. 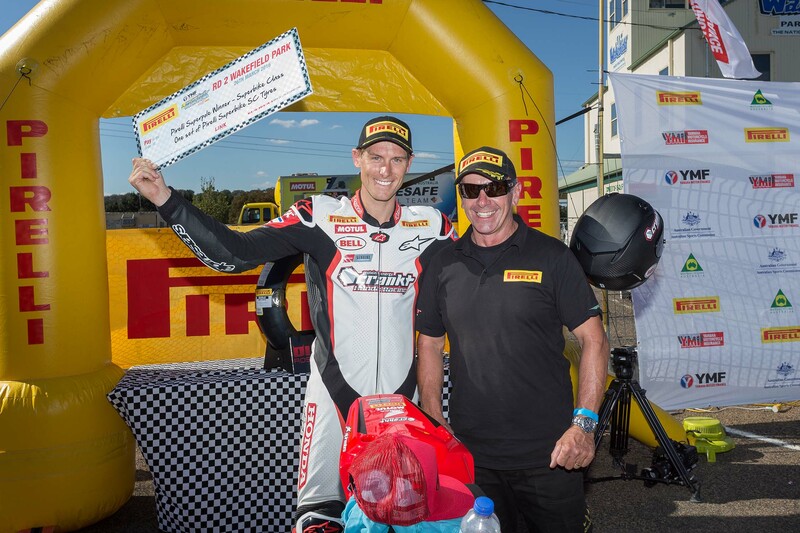 “It’s pretty cool to be winning a tyre that just set the fastest lap around Wakefield Park, people can go out and buy that exact tyre so it’s pretty cool,” he said. “It was a great session, and it’s really exciting having Superpole here at ASBK. Everyone always asks me why I ride a push bike so much, but it felt like I was in a criterium race out there. Riders and teams will now begin preparation for tomorrow, where Supersport and Superbike riders will take to the grid for Round 2 racing. For more information on the 2016 Yamaha Motor Finance Australian Superbike Championship presented by Motul Pirelli, head to www.asbk.com.au or like the ASBK on Facebook, to stay up to date with all of the pics, race results and more.